~ Giveaway has ended – Heartfelt thanks to all who entered! Congratulations to Susan G. for posting the selected comment! 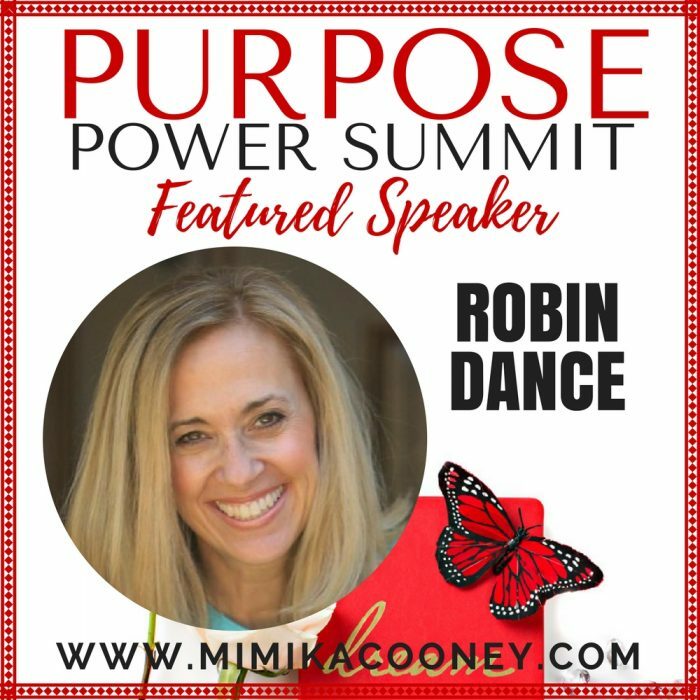 When Mimika Cooney reached out to me to participate with the Purpose Power Summit she was putting together, I carefully (prayerfully) evaluated if this was an #OYTO opportunity or something I should politely decline. But as soon as spoke with her (gah! that irresistible South African accent) and understood her vision for the online event, I was in. Empower and equip women to step into their life’s calling? Check. Content from a team of gifted, talented, inspiring speakers? Check. Free and virtual, meaning you can watch at your convenience and from the comfort of comfy clothes? Check check. Free gifts from each of the speakers? Funnest check of them all. The #PPS2018 runs from February 26-March 9 and you can register for free here to access all content. If you’ve never taken part in an online conference, this is the perfect one to try. 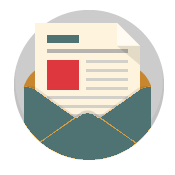 Mimika emails links to new speakers daily, and you can download all the freebies as soon as you register. Some of the speakers will be familiar, some will be new to you, but all of them have something of value to speak into your life. If you’ve been toying with an idea, are questioning where to serve, or need a creative spark to light your fire, please take advantage of this summit. Why you might not be able to watch every minute of every video, the time you invest will pay you back in ideas and inspiration. My video goes live on Tuesday, March 6th at 2:00pm EST. I’m sure you’re marking your calendars now. No, seriously, add it to your calendar, let’s watch together, and then discuss. I cannot wait to see how the segment turns out…and my sincere hope and prayer is that those who do watch will be inspired, motivated, and ready to take a next step, no matter what that “next step” is. 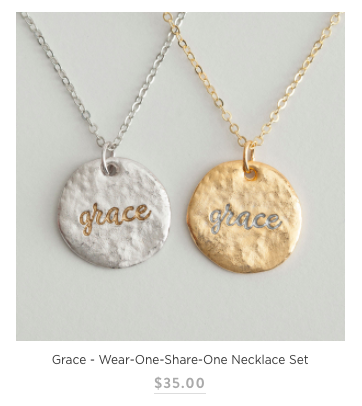 Added: Each bundle will include a “Wear One, Share One” necklace set! 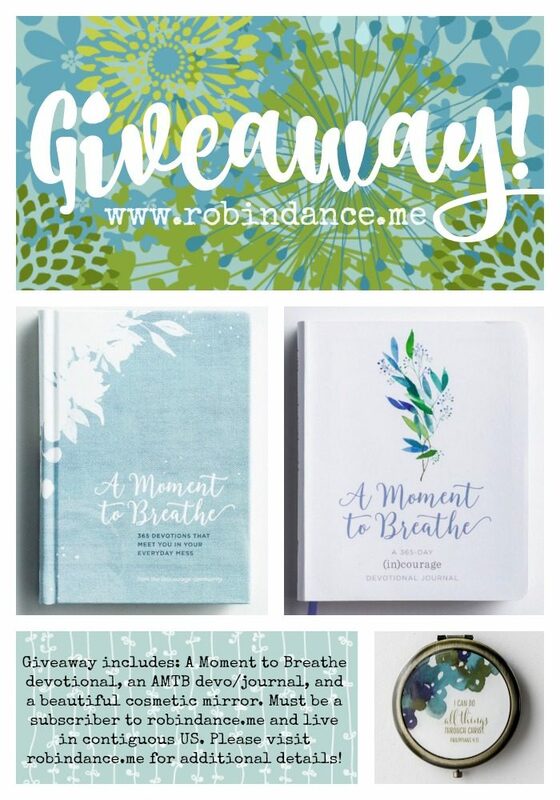 Recipient will receive a copy of the A Moment to Breathe devotional, an A Moment to Breathe devoional journal, and a Courage Clip Frame & Art Print Set. One winner will be selected randomly from comments to this blog post; a second winner will be selected from comments to my Facebook post with this graphic. Comments made 2/26/18-3/9/18 are eligible. 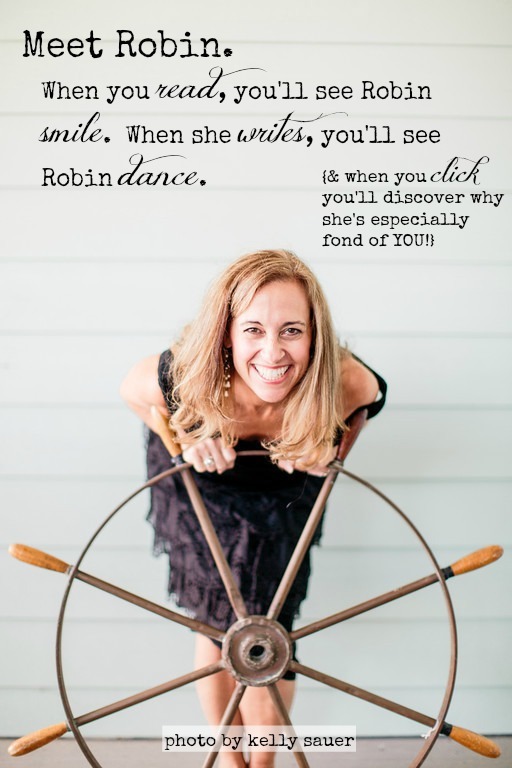 Must be a subscriber to robindance.me and live in contiguous US. You’re welcome to comment both on Facebook and this post; but eligible to win just one bundle. Use the code #PPS2018 at checkout! Before you go, let’s connect? Sometimes I’m Shy (Like When I Do Things Like This) + A Giveaway! First, set your calendar for tomorrow at 10am EST. BEFORE IT’S AVAILABLE FOR PURCHASE!! Most people who know me would consider me an extrovert. I can work a room like nobody’s business when I need to and it looks like it comes easy for me. Natural. Well, pass me an Oscar. I’ve earned it, if that’s what you think. While I do love people and I’m naturally friendly, introducing myself to strangers or beginning a conversation with those I don’t know well (or even folks I’ve “known” on the internets FOREVER) makes me shake in my shoes. I’ve just learned ways to be the boss of those silly fears. I’m convinced it’s important to be the one to BE the one. My (in)courage sisters would say that second thing is “going first,” being willing to share your story, initiating a conversation or gathering, or plain and simple, getting the old ball rolling on friendship. To tell you more about it, I’ll be hosting a Facebook Live tomorrow morning at 10am EST (Friday, September 29th). Why? 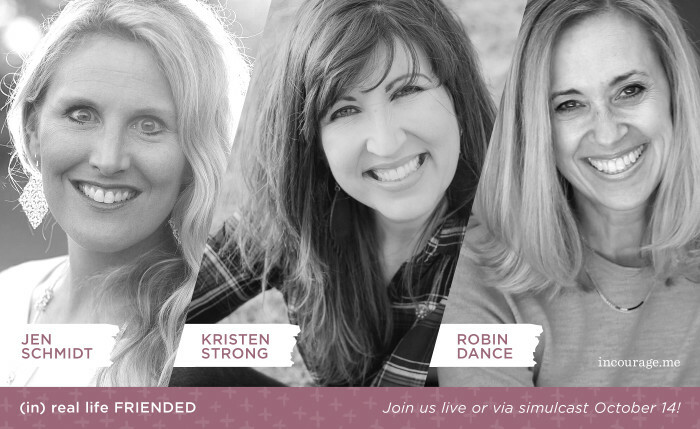 BECAUSE I’M SO EXCITED ABOUT IT – thrilled to participate as a panelist, sure, but more so because of the inspiring, motivating, and encouraging content from all the amazing featured guests. 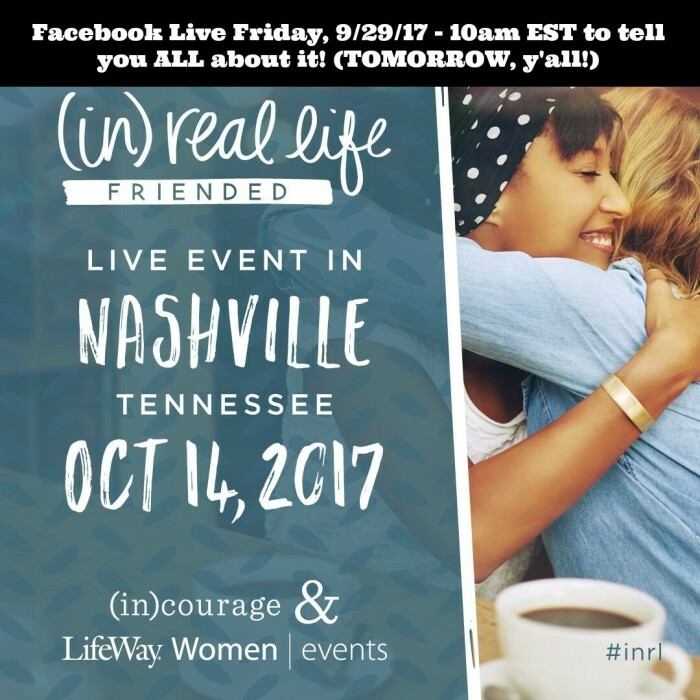 It’s a wonderful opportunity for a Girls Weekend Away, or, if traveling to Nashville isn’t a possibility for you, Lifeway has made a way for anyone to join us via the comfort of home or church via a very affordable simulcast. I’m a little mortified to host a Facebook Live; WHAT IF NO ONE WATCHES IT? 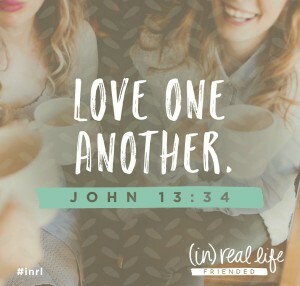 And I really, really want you all to tune in to learn more about inRL: FRIENDED because it’s going to be such a special gathering. Even if you can’t make it at 10am EST, you can watch the video anytime. (After it’s over, I’ll be sure to pop a link directly into this post). Comment to this post (questions about the event, topics you’d like me to address during the Facebook Live, whether or not you’ll be attending, or why you’d like to win a copy. ANY COMMENT WILL BE AN ENTRY!). Comment during the Facebook Live OR on the replay if you’re viewing later. and invite others to join us, too? Tag me so I’ll see it, and THANK YOU in advance. In addition to the lovely friends pictured above, Aliza Latta, Holley Gerth, Alia Joy and Jennifer Lee will be joining me as panelists. Lisa-Jo Baker, Chrystal Hurst and Annie Downs are featured speakers and Meredith Andrews will lead worship. as soon as you get me your address. Thanks to all for commenting! 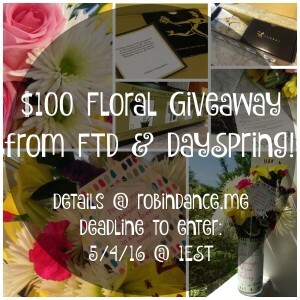 $100 Giveaway from FTD Flowers & DaySpring!! Receiving flowers, especially when they’re unexpected, is magical. that were still living from some fresh flowers I bought last week. 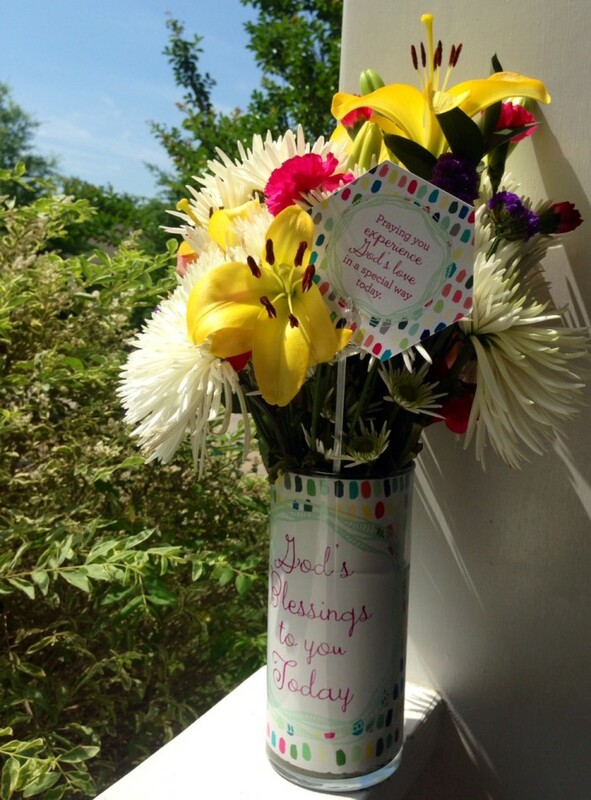 I was out of town last week for business meetings when I received an email notification for a floral delivery. Who in THE world was sending me flowers? and better yet, Why? I knew it wasn’t my husband–he wouldn’t have arranged a delivery while I was out of town. My birthday was over a month ago, Valentine’s was long past, and all I could come up with was Mother’s Day, though these flowers were set to arrive 1½ weeks prior to that day. I hastily concluded my oldest son must’ve ordered them for an early Mother’s Day gift–he’s the only kid of mine I thought might do something like that. Instead, they were from our leadership team at incourage, letting us know about a new partnership between DaySpring and FTD. There are several options for different occasions, but my favorite might just be the Happy Birthday Bouquet–gerbera daisies are one of my favorite flowers. 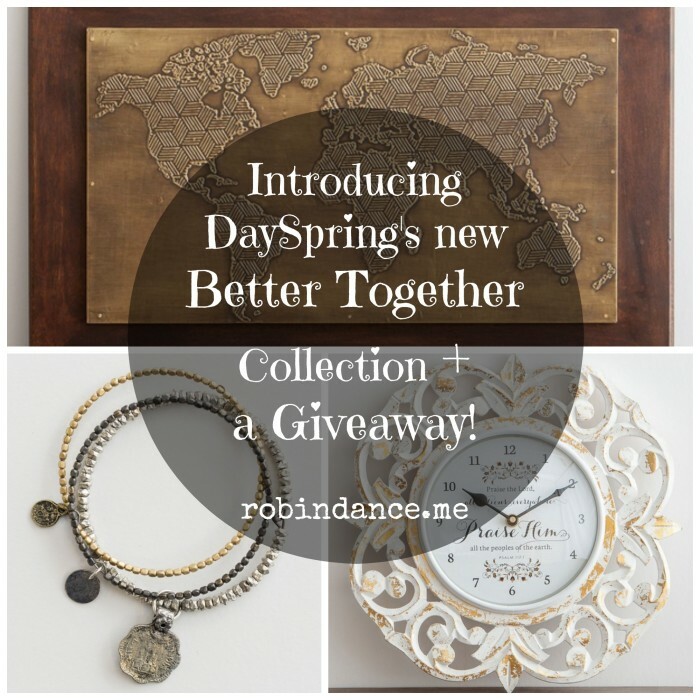 To help get the word out about this new collaboration between two amazing brands, FTD (and DaySpring) is offering one of my readers a $100 gift card! 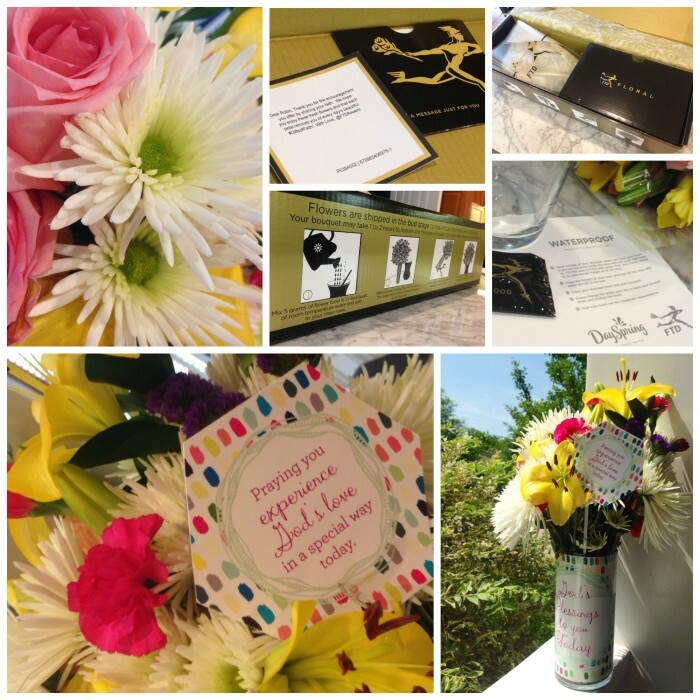 The giveaway is more than enough to purchase your favorite bouquet and have it delivered pronto. But you’ll have to hurry–the deadline to enter is 1 EST on Wednesday, May 4th (offered within the continental U.S. only). I’ll select one blucky winner (blessed+lucky) and if you order right away, I think there’s enough time to have the flowers delivered by Mother’s Day if you choose! Congratulations to Sandy whose name was selected for this FUN giveaway!! Thank you to all who entered! 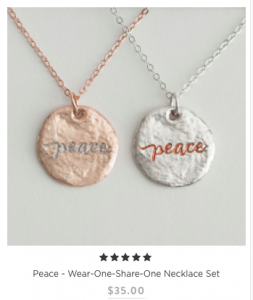 Better Together || A Giveaway With 3 Winners – Enter NOW! As a writer for incourage and an affiliate for DaySpring, I sometimes learn about new product lines before they arrive online or in stores. I even got to join a team a while back for a few days of brainstorming to ideate new items for the Friendship on Purpose collection. My personal favorite idea was a “Giving Plate,” but apparently that was already invented a few times…. (clearly meaning I’m a late-to-the-party visionary). The world. Ever since we lived in Germany, I’ve truly believed it’s a small world after all. When I saw this piece of art, I had to have it as a reminder of where we’ve been and how we’re changed as a result. Village Artisan Bangles. There’s a beautiful story behind these bracelets and I love how it’s empowering women (and men) to better their lives. Bonus? They’re even prettier than I imagined. You’ll love the mixed metal. Praise Him Wooden Clock. We like having an analog clock around for when lightning strikes or the power goes out, and this one is a lovely addition to just about any decor. Follow me on Instagram (@PensieveRobin), look for the graphic above, and leave a comment to the post (tag it #BetterTogether). Friend me on Facebook and leave a comment to this post with the graphic above. Be sure to indicate which item you’d like to win (you must live in the continental US to be eligible). Deadline to enter is Friday, October 23rd at midnight. Questions? Just ask in comments and I’ll reply as soon as I can! Tons of new items in their shop – check back frequently!! I think one reason we’re more quick to offer help as opposed to ask for help is because it really is more fun to give than to receive. So in celebration of my birthday today, I asked DaySpring if they’d let me give away some of my favorite things from their shop. I couldn’t believe when they said yes to all of my suggestions! Copy of Beauty of Grace – Around 50 stories curated by Dawn Camp (you’ll find my submission on p. 130!!!). Fringe Hours Canvas Pouch – LOVE the color palette from The Fringe Hours product line; I had to have this versatile bag. BTW, most of it is B1G1 until tomorrow!! Comment to this post by writing a poem. Yes, a poem!! It can be any form–haiku, cinquain, a simple rhyme, couplet, sonnet, limerick….IT’S MY BIRTHDAY AND THIS IS A WONDERFUL PRIZE PACK AND YOUR POEMS WILL BE LITTLE GIFTS IN MY INBOX!!! Don’t be shy…just try! <– see what I did there? Enter as many times as you like but each poem must be entered as a separate comment. International readers are welcome to enter understanding shipping will be at your expense…. (sorry, that’s the only way I can include you 🙂 ). Deadline to enter is Monday, April 6th at 8:00am. Oh, what the heck–if you’re really poetry-shy, you can leave a plain ol’ comment, and if it’s thoughtful and kind and demonstrates that you’ve actually read this post, I’ll consider that free verse and call it a day. I’ll choose my favorite poem to win this entire, special-to-me prize pack!! Please help me out by sharing this post on your favorite social networks? Be sure to tag me somehow so I’ll know to thank you! 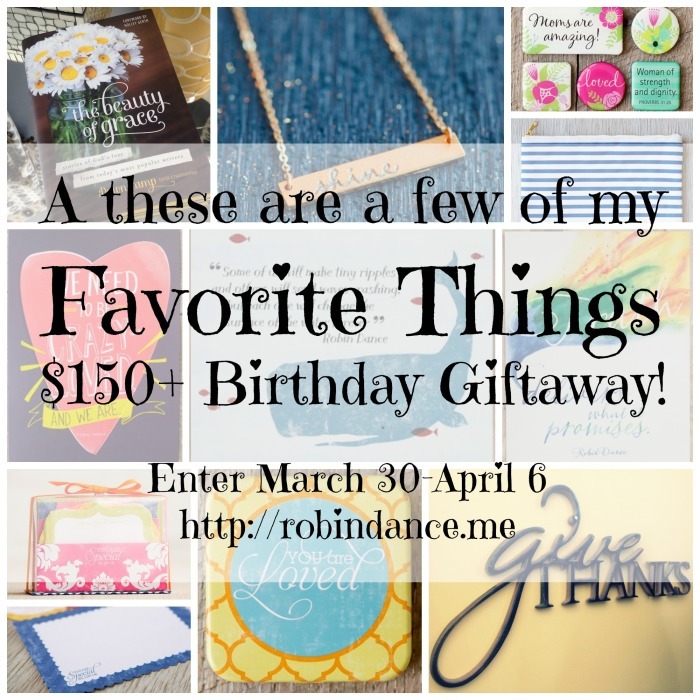 FINAL Birthday Bash Giveaway #10 – dotMOM conference passes & author books! It's Saturday. We've been bashing for two weeks. Let's make this short and sweet. For today's giveaway, I'm grateful to Lifeway Women for providing two passes to their dotMOM Conference in Chattanooga this fall–September 20 & 21. Speakers include my lovie Jen Hatmaker, Angela Thomas and John Crowell, and worship will be lead by Lauren Chandler. In addition, the giveaway winner will receive a copy of Jen's wonderful book, 7 Experiment: Staging Your Own Mutiny Against Excess and a study/workbook by Angela Thomas. To enter today's giveaway, please comment why you would like to win passes to the conference. After you fulfill this mandatory entry, you're welcome to share this post on your favorite networking sites and then comment the URL to your pin, tweet, FB status, etc. Please enter only if you're sure you can attend the conference in September!! Comments will remain open until April 14th at midnight EST.